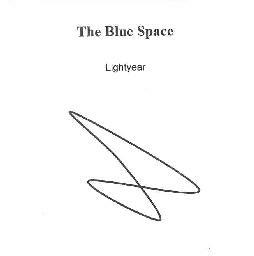 The Blue Space - "Lightyear"
Here is a self released CD by a progressive rock fiend from Newtown, CT. He records under the name of Lightyear and his info states that this CD was thirty years in the making. I was intrigued as to what the content was? maybe it was a masterpiece! The Blue Space runs for just over 70 minutes and hosts 13 tracks of varied lengths. It has a selection of "song" songs mingled amongst strange atmospheric numbers. There is a lot of good synthy stuff in places but I thought that a lot was a bit sloppy in the way of things that should not really be there... hiss, clicks and tick. But luckily I could see past that, which the listener must do if they are to indulge. Personally I am not a big fan of Prog Rock and I don't think that this album is essentially Prog Rock. There are moments but I think it is more a strange visiting that only comes now and then. I admire Lightyear's passion for his music. He does the music he likes and I'm sure that people out there will take a shine to it. Sadly I cannot get into it his songs, but I think that the instrumental things like 'Daytime Girl', 'Emerald', 'The Blue Space', and 'Nebula' all offer nice little ambient synthy pieces that are done in a very nice way indeed. The sounds used and the atmospheres created are very mellow and absorbing... an interesting journey I thought. It is just the songs that I can't get into, the guitar work is a mish-mash of out-of-tune stuff, (surely a tuner is needed!!!!). The synthy parts are great but I think that they would be better if the sound quality was improved. The production is not to good either but through all this the music is still allowed to speak its language to the listener with perfect sense. There is also a version of Willie Dixon's 'Spoonful' on here. Thirty years in the making and it is surely just the beginning of a fruitful affair. Lightyear knows how to record his work and write and perform it. That's all that matters. Even though it was not really my cup of tea, in parts it caught my attention and almost enthralled me. The fact is he is doing stuff and that is what it's about. I don't care about fancy covers and stuff. They are nice to look at but it is the music that counts after all. So I hope that he keeps at it and I would like to hear more from him. Maybe the next one may be a cracker? For more information you can email The Blue Space at: ccowles@worldnet.att.net. Contact via snail mail c/o C. Cowles; 28 Turkey Hill Rd; Newtown, CT 06470.